In Fecke v. Bd. of Supervisors Louisiana St. Univ. & Agricultural & Mech. College, a case from the Supreme Court of Louisiana, a college senior went to an indoor rock climbing facility located on the university campus. He had been enrolled in an Outdoor Living Skills Activity course and this rock climbing activity was actually a mandatory requirement. 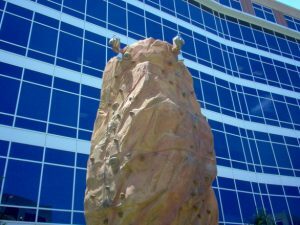 Once plaintiff arrived at the rock climbing facility, she completed a participation agreement as the staff asked her to do. Following her signing the participation form, there was instruction into how to make the climb, and she successfully climbed the wall. However, on the way back down from the wall, she fell to the ground. When she hit the ground, she landed on her foot hard and fractured the talus bone. The talus bone is a very small bone that fits between the tibia and the heel, and is essentially the main component of the ankle joint. A broken talus can be a very serious injury and can lead to permanent disability, as our Boston personal injury lawyers have seen in various cases over the years. In this case, her talus was broken, and this resulted in the need for three separate surgical procedures. This left her with the need for a fourth surgery and the choice of either having a permanent ankle fusion or a total ankle placement procedure. Neither of these were a welcoming prospect to a college age student. At this point, plaintiff filed a suit for damages against the school’s board of trustees. There was a trial by jury and jury determined, after hearing testimony, that the school was 75 percent at fault for this injury and the plaintiff was 25 percent at fault for this accident. Following trial, the jury awarded plaintiff nearly $2 million in damages and her mother an additional $50,000 as part of what is known as a loss of consortium claim. It should be noted that a loss of consortium claim between parents and children are not awarded as a general rule in the Commonwealth of Massachusetts, but were in the jurisdiction in which this case was tried. At this point, defendant appealed the verdict on several grounds. The main arguments were that plaintiff was not entitled to interest on damages for future medical expenses, attorneys fees and costs for future medical expenses damages, and damages for loss of future earnings. The issue with respect to lost wages had to do with the fact that the plaintiff was unemployed at the time of trial. Trial courts do not typically like to do much speculation on future damages, especially when we are talking lost wages. For this reason, the court of appeals determined plaintiff was not entitled to these damages based upon the relevant state law. The court agreed that plaintiff was entitled to damages for future medical expenses, but not for interest on those judgments and affirmed and reversed in part with respect to this argument.